This is the general discussion and build thread for the RYO Optodist, what is the Optodist?.. The Optodist is based on two Advanced Photonix (formerly known as Silonex) optocouplers that gives its characterful overdriven sound and plucky dynamic response to CV, it is equally at home adding a bit of extra crisp to highs and mids or warming up your lows as it is turning a resonant filter into a howling beast or your drums into crushing carnage. The Optodist comes supplied with the SR3 optocoupler but is also designed to handle the SR2 version. 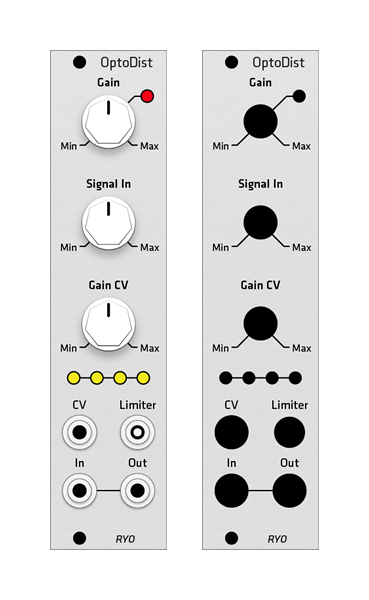 SR3 givies a tighter, snappier CV response and have less bleed through of the signal when gain is fully off and signal in is set to low settings for a somewhat clean signal or with a lighter distortion. Please note that due to the nature of the vactrol-style optocouplers, response behaviour may vary between different factory batches. Thank you for stopping by the thread and keep posting your questions and ideas in the thread, we'll try answer it best we can, also big thanks to all of you builders and users that help each other out when we're not around the forum! I've got an OptoDist kit on order so I'll be doing an aluminum panel for this one. I've also talked with Ljunggren Audio and we're going to coordinate releases so that aluminum panels will come out whenever new kits are available. There was interest in the other thread and I'll be building a few more of these kits myself so it made sense. Really nice panels, thanks alot. We will add some kits without panel next week if you want to get grayscale or make your own. The panels don't cost very much so don't count on a big cut in price. Free visually rejected panels (scratches, bad silkscreen or other non mechanical faults) will be included as long as stock lasts so you have something to just mount the module with while you wait for your preferred panel. Do you plan to sell PCBs only or that's something you'll never do ? And I didn't find a mailing list ? Oo, I definitely want one of these, hope you still have some by the time I get paid!! Cool, more quality DIY kits. The Instructions look great, really well laid out. I'll order an SR3 version when they are in stock next. Perhaps I didnt understand the navigation, but upon following the link all I could see what a since optodist front panel..should I have clicked on that fr more info? Is there a PCB only available? Are there discounts for multiple item orders (ex. 5 kits, etc)? What does "roll your own" refer to? Are you saying that it uses a vactrol-type optocoupler and the PCB leaves room for someone to combine a 3mm LED and a small LDR with shrink tubing or electrical tape? My apologies if Ive asked any retarded or previously cvered questions (in another thread perhaps? ), im new. What does "roll your own" refer to? Its a colloquial way of saying "build it yourself" or "DIY"; the term originally refers to rolling cigarettes from paper and loose tobacco rather than buying pre-made commercial cigarettes. Does "skip this one" mean don't install it now, but later? Or don't install it at all? If so, why? The photographs all show R8 installed. The prices are in SEK, you can use a currency converting service like xe.com or similar to get a rough estimation, it will essentially be your card provider or paypal that sets the exchange rate on the final price. The price to US is 448 SEK (price excl VAT). If you choose your country in the checkout the webshop will not charge european taxes to countries outside EU trade area. Shipping costs will also be added in the checkout stage. I linked to the shops start page, if you click on the image or "read more" you will be directed to the product page, I will add an additional direct link in my first post as well. We have no plans on offering PCB or panel only, the profits has been calculated in a way that we need to sell kits to make it turn around. We hope you understand this decision. Discount won't be offered at this early stage. Vactrol-style Silonex brand optocouplers are included in the kit, we haven't experimented with hand-made optocouplers on the Optodist so far. Feel free to check out the build docs here, it might clear a few things up. As I wrote above, PCBs will not be offered due to the profit margins in the company. We don't have an official mailing list, but you can PM me your email and we'll send you updates about new products in the store. If anyone here has a suggestion on a good maillist service, we're all ears! It means don't install it at all. We figured out it didn't make any difference after taking the photos. Also in another place where the pictures show washers on the pots above the panel and the text say put the washer under the panel and not over. The text is the correct instruction. We apologize for these errors and we intend to correct them as soon as possible. A few SR3 have been added into stock now. Personally I am much more interested that RYO has an active, responsive and helpful presence here on Muffs than that they would have an email list, yahoo group or whatever. Many thanks for bringing these kits to market. I don't personally see why it's a problem to only sell kits. I can source parts OK, but it's a pain sometimes. Plus I'm sure I'll soon end up with a mountain of components I don't need. I can also see why some would want the PCB only, building into 4u etc. Maybe for the future, it's possible to consider PCB's if you just order extra's than you need for the kits, and then sell a few PCB's on their own but add a bit extra to the cost to cover for loss of profit from the kits ? My partner uses mailchimp for her mail outs. She thinks it is good, I've never used it myself. It's free if your mail list is less than 2000 names. i guess that means no schematics either...? Happy to see there's a Grayscale option for these. Any possibility of a demo or two? I'm mostly interested in listening to the saturation or a subtle distortion effect. The optodist page already links to one demo but could usefully link to these other demos on soundcloud. Any idea if this will run on +/-15v? It's a small module. No rare parts. I already have almost all the components and I don't see why I would buy them twice at the full price and pay the full price for shipping something I already have. Not to mention that the crowd buying PCBs will not follow, in the future, the new products of this new company. @Spip, Of course you have a point, and see, I was also suggesting a possible future solution if RYO had a change of heart. It's not my business, so not my concern either way. RYO has laid out the reasons for not doing PCB's on their own, it's RYO's choice, so we have to go with what he/she/they have decided. If it was me wanting PCB on their own, I would have had that conversation via PM to see if anything could be sorted out privately. Oakley and Hexinverter spring to mind. I personally buy both kits, and PCB's/Panels. I've ordered this kit, as with me, kits always get built quickly. My backlog of PCB/Panel combo's are still waiting for me to get all the parts together. I just think we are lucky to have people making these products available, and I'm happy to purchase these things to help support what you rightly say is a niche market.